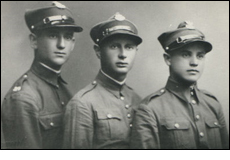 Samuel Jarniewski a Jew served in the Polish Army, and on the 11 September 1939, he was captured near Lomsha, eastern Poland. After long periods in a number of prisoner of war camps, Stalag 1 A near Konigsberg, Lablaken in Libau and Stalag 2b at Hammerstein, West Prussia. In late October 1940 Samuel and his fellow prisoners were sent to a Jewish camp at Biala- Podlaska and this is where we join this account. We arrived at Biala – Podlaska at the end of October 1940 late in the evening. With great fear we waited for the reception and what would come. When we saw the SS men dressed in black watching us after taking over the transport, we were very sad. After a half an hour march we arrived at the camp. When we saw the sign at the camp, “Jewish Camp in Biala- Podlaska,” we realised the big lie that we had been told at Stalag 1A. We were put behind a fence again, but this time on the other side were SS men and their paid Ukrainian murderers. When we entered the living blocks that had been chosen for us, we met there the old inhabitants of the camp who were civilian Jews from Poland. We found these people in an indescribable state; barefoot, badly clothed and starving. Immediately I saw the picture of what was waiting for us in the future. Millions of flies prevented us from resting after the long journey. We also got to know the cruel reality of what had happened here in the gouvernment and with the Jewish people during the one year of my absence. I also learned that we were to replace the old people of the camp who had no strength anymore for the hard work of constructing an airfield in Biala- Podlaska. In the early morning of the following day we were ordered to work. When the building managers of the airfield saw us, they were very happy to receive new workers. Most of the building managers were soldiers of the Air Force and cannot say that they treated us badly. After their intervention, the living blocks were disinfected, and after one case of very bad treatment on the march from work, we were fetched and brought back in from the camp under the guard of the Air Force. Many of our comrades escaped to the River Bug in order to reach their homes but several of my comrades and I received warnings in letters from our families not to come home in this illegal way. 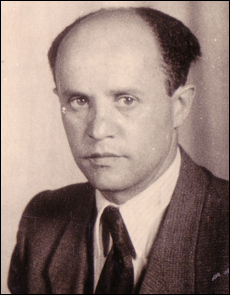 There was also the possibility of leaving the camp in order to become a member of the Jewish civilian government (Judenrat), but I advised my fiends not to and made the decision never to leave the camp. It was better to be a prisoner of war in the camp than to bear the fate of the civilian Jewish people. And so I went daily to my work on the airfield and did my best not to go hungry. I waited patiently for what was to come. Every day we grew fewer and fewer in numbers, partly by leaving and partly by escape. I received letters from home and from countrymen that were in the Judenrat. One day at the end of December some of us became ill from typhus and by order of the military doctor, the camp was sealed off. The illness became an epidemic and soon many of us were ill and went into the sick room. Conditions in the sick room were unbearable and we were two, sometimes three to a bed. The nursing was good but we had nothing with which to recover, no tea, or other beverages that were necessary for this dangerous illness. Before my illness I received some money from my friends and with this money I bought some bottles of red wine that were the only refreshments I had during my illness. I also separated myself from my comrades who had been lying in the bed with me. Although the cases of death were small in comparison to those from the treatment and conditions after the illness, the sickness was a hard one. It was months until I was healthy again. Five hundred people got sick in the course of the winter. In February of 1941, when we were closed off in the camp because of the epidemic, we saw large military movements on the road to the River Bug. Day by day, transports were driven to the river. We had a lot of time to observe this accurately. 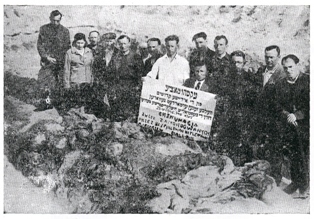 The Jewish civilian workers had to work with a feverish speed in order to repair the road that led to Moscow – Warsaw. Several of us already saw the beginnings of a war against the Soviets and with frightened hearts we feared for the fate of our families who had been safe until then. Our weak state of health however, did not allow us to think so much. Our futures were already grey and we had to concentrate on regaining our health. Slowly we recovered everyone to his opportunities; some from home packages and some from the camp kitchen. Some of us thought that the winter would soon be over and as surviving typhus in wartime is good we consoled ourselves in this terrible time. In March 1941, around the twelfth, or thirteenth, S.D. men were placed around the camp and everyone was given the order to enter except for the people from the sick room. Some of us were quite weak and not completely healthy but there was nothing to do, an order is an order. We al took our packages and other possessions and were counted off; we were more than three hundred. We were marched to the station under very strong guard, loaded into trains and travelled in a direction that was unknown to us. Our chief worry was not to be sent to the big prisoner camp in Lublin where we heard that our comrades were being treated even worse than in Biala- Podlaska. We had no possibility to change our course though; only an escape would change it and most of us were too weak to escape.